What is a CUPE Local Union? As a member of CUPE, you are a member of a CUPE local union. A CUPE local union is made up of you and your co-workers and is generally comprised of the employees from a specific employer or workplace. A Local Union is the basic unit of a trade union organization. Local Unions elect officers, have their own bylaws and are usually responsible for the day-to-day administration of the collective agreements covering their members. 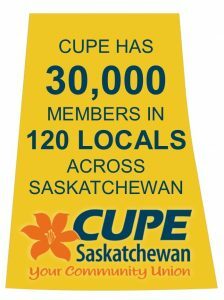 There are over 120 CUPE local unions of various sizes across Saskatchewan. The smallest local has half a dozen members while the largest has 13,600 members. Across Canada, there are more than 2,382 CUPE locals. Nearly every community in the country has one or more CUPE locals. Fellow CUPE members are elected to leadership positions within their local union. Locals set their own bargaining demands, work with the national representative to negotiate their collective agreement, handle grievances with employers and decide what issues the members want to support. Does your Local Union have a website link not listed below? Contact Nathan at 306-757-1009. Local 650-1 Regina Labour Building Assoc. Local 1831 Regina Community Health Service Assoc. Local 1902-9 U of S Students Union Child Care Inc.
Local 4909 Biggar community Assoc.